"Sarah Lawrence" redirects here. For other uses, see Sarah Lawrence (disambiguation). Sarah Lawrence College is a private liberal arts college in Yonkers, New York. It is known for its low student-to-faculty ratio and highly individualized course of study. The school models its approach to education after the Oxford/Cambridge system of one-on-one student-faculty tutorials, which are a key component in all areas of study. Sarah Lawrence emphasizes scholarship, particularly in the humanities, performing arts, and writing, and places high value on independent study. Sarah Lawrence College is ranked 53rd in the National Liberal Arts Colleges category in 2018 by U.S. News & World Report. Sarah Lawrence was also named the higher education institution with the "best classroom experience" in all of America by Princeton Review in 2016. Sarah Lawrence College was established by real-estate mogul William Van Duzer Lawrence (1842-1927) on the grounds of his estate in Westchester County and was named in honor of his wife, Sarah Bates Lawrence (1846-1926). The College was originally intended to provide instruction in the arts and humanities for women. A major component of the College's early curriculum was "productive leisure," wherein students were required to work for eight hours weekly in such fields as modeling, shorthand, typewriting, applying makeup, and gardening. Its pedagogy, modeled on the tutorial system of Oxford University, combined independent research projects, individually supervised by the teaching faculty, and seminars with low student-to-faculty ratio—a pattern it retains to the present, despite its cost. Sarah Lawrence was the first liberal arts college in the United States to incorporate a rigorous approach to the arts with the principles of progressive education, focusing on the primacy of teaching and the concentration of curricular efforts on individual needs. In addition to founding Sarah Lawrence College, William Lawrence played a critical role in the development of the neighboring community of Bronxville, New York. His name can be found on the affluent Lawrence Park and Lawrence Park West neighborhoods, the Houlihan Lawrence Real Estate Corporation, and on Lawrence Hospital in downtown Bronxville, an institution that was created when Lawrence's son, Dudley, nearly died en route to a hospital in neighboring New York City. Lawrence embodied ideas from the Progressivist movement of the 1890s, especially his view that the arts were a crucial element in the social evolution of individuals and families, in developing both private and public sensibilities, and in creating equal relations between men and women. Harold Taylor, President of Sarah Lawrence College from 1945 to 1959, greatly influenced the college. Taylor, elected president at age 30, maintained a friendship with educational philosopher John Dewey, and worked to employ the Dewey method at Sarah Lawrence. Taylor spent much of his career calling for educational reform in the United States, using the success of his own College as an example of the possibilities of a personalized, modern, and rigorous approach to higher education. Sarah Lawrence became a coeducational institution in 1968. 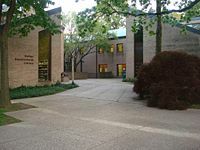 Prior to this transition, there were discussions about relocating the school and merging it with Princeton University, but the administration opted to remain independent. At the undergraduate level, Sarah Lawrence offers an alternative to traditional majors. Students pursue a wide variety of courses in four different curricular distributions: the Creative Arts (writing, music, dance, theatre, film, and the plastic arts, such as painting, printmaking, drawing and sculpture); history and the social sciences (e.g., anthropology, economics, political science, and sociology); the humanities (e.g., Asian studies, art history, film studies, languages, literature, philosophy, and religion); and natural science and mathematics (biology, chemistry, physics, computer science, and mathematics). Classes are structured around a seminar-conference system through which students learn in small, highly interactive seminars and private tutorials with professors. Each student is assigned to a faculty advisor, known as a "don," who helps the student plan a course of study and provides ongoing academic guidance. Most courses, apart from those in the performing arts, consist of two parts: the seminar, limited to 15 students, and conferences, which is a meeting with a seminar professor. In these conferences, students develop individual projects that extend the course material and link it to their personal interests. Sarah Lawrence has no required courses, and traditional examinations have largely been supplanted by research papers. Additionally, grades are recorded only for transcript purposes—narrative evaluations are given in lieu of grades. The College sponsors international programs in Florence, at Wadham College, Oxford, at Reid Hall in Paris, and at the British American Drama Academy in London. Sarah Lawrence also has the longest-running study abroad program in Havana, Cuba. Sarah Lawrence also offers Master's-level programs in Writing, the Art of Teaching, Child Development, Theatre, Dance, and Dance/Movement Therapy and is home to the nation's oldest graduate program in Women's History and the nation's first master's degree programs in Human Genetics and Health Advocacy. Sarah Lawrence offers a program for people wishing to seek a B.A., or a Master's and have been out of school for any period. Eugene Lang College Exchange Program: In 1996 the college began its exchange program with Eugene Lang College, the undergraduate division of the New School in New York City. Eugene Lang has particular strengths in the social sciences. Qualified students may cross-register in courses in other divisions of the New School, including the graduate divisions. Students must have strong academic records and have completed the first and sophomore years. Qualified students also have the opportunity to participate in Lang's exchange program at the University of Amsterdam, the Netherlands. Spelman College Exchange Program: Beginning in spring 2007, female SLC students began participating in an exchange program with Spelman College in Atlanta, Georgia. . The College has a number of international programs in four countries. Sarah Lawrence makes all practical efforts to preserve its most characteristic elements, such as one-on-one interaction with professors, small classes, and an emphasis on qualitative comprehension, in its programs overseas. Havana: This program is the longest-running in Cuba by an American university. The program just completed its eleventh year in 2011. The course offerings at the University of Havana include Afro-Cuban culture, art history, Cuban or Latin American cinema, Cuban history, Latin American studies, literature, psychology, urban and rural sociology, U.S.-Cuban relations, and women's studies. All courses are taught by Cuban faculty and are attended by Cuban students. Each student is also required to enroll in an advanced Spanish course. The most distinctive feature is an affiliation with Centro de Estudios Demográficos (CEDEM), one of the research centers at the University of Havana. At CEDEM students meet with experts whose research and professional expertise focus on developments in contemporary Cuban society. Students select a research topic and are paired with a professor from CEDEM with whom they meet on a regular basis, much like the regular conference structure. London: Jointly sponsored by the British American Drama Academy and Sarah Lawrence College, the program expands Sarah Lawrence's long-standing and vibrant tradition in the performing arts by exposing students to the rigors of professional British training in acting. The faculty includes some of Britain's most distinguished actors and directors. The heart of each student's program is scene study in classical and modern works. Students also take courses in voice, movement, and stage fighting and participate in fully staged performances at the end of each term. Oxford: Since 1985, Sarah Lawrence College has been associated with Wadham College, one of the undergraduate colleges of Oxford University in England. This program is open to select juniors and seniors. Students are best prepared to undertake the demands of Oxford if their coursework in their first and sophomore years have included significant analytical and written work. Leeds: Students who are admitted into the University of Leeds program have access to a variety of disciplines and academic strengths. The academic year runs from September through the end of May and is made up of two semesters. Students will take a combination of lectures, seminars, and tutorials, with additional time for private study, labs (sciences) and fieldwork. Students will meet with a Sarah Lawrence program advisor in determining their course of study each semester. Dartington: A highly competitive, music based exchange with Dartington College of the Arts in southern England. The program is open to qualified students with interest in experimental music and media. Paris: Centered at historic Reid Hall in the Montparnasse quarter of Paris, the program is Sarah Lawrence's oldest and focuses on the humanities and creative arts. The program is conducted entirely in French and includes one required French-language class and three other courses of the student's choosing. Classes may be taken at the University of Paris, Institut d’Etudes Politiques, the Ecole du Louvre, and the Institut Catholique, or other, more specialized institutions. Catania: Open to students who have an advanced comprehension of Italian, the Catania program takes advantage of its Sicilian setting to provide students with an experience in cultural immersion. Students enroll directly at the University of Catania and choose courses offered by the Humanities department, including: Medieval History, Modern Italian Literature, History of Philosophy, Archaeology, Greek and Roman Art History, History of Theatrical Arts, Comparative Literature, Byzantine History, and the History of Europe. The Sarah Lawrence College Art of Teaching Program offers training in education in both degree-track and continuing education formats. One component of the program is the Empowering Teachers Program, which was established in 1989 as a forum for the support of teachers and educational administrators, and has since expanded into a resource and network for more than 250 beginning and experienced professionals from 25 school districts in Westchester County and adjacent areas of New York, Connecticut and New Jersey. In 2007, some educators in the United States began to question the impact of rankings on the college admissions process, due in part to the 11 March 2007 The Washington Post article "The Cost of Bucking College Rankings" by Dr. Michele Tolela Myers, a former president of Sarah Lawrence College. As Sarah Lawrence College dropped its SAT test score submission requirement for its undergraduate applicants in 2003, thus joining the SAT optional movement for undergraduate admission, SLC does not have SAT data to send to U.S. News for its national survey. Of this decision, Myers states, "We are a writing-intensive school, and the information produced by SAT scores added little to our ability to predict how a student would do at our college; it did, however, do much to bias admission in favor of those who could afford expensive coaching sessions." At the time, Sarah Lawrence was the only American college that completely disregarded SAT scores in its admission process. As a result of this policy, in the same The Washington Post article, Dr. Myers stated that she was informed by the U.S. News & World Report that if no SAT scores were submitted, U.S. News would "make up a number" to use in its magazines. She further argues that if SLC were to decide to stop sending all data to U.S. News & World Report, their ranking would be artificially decreased. Sarah Lawrence College now maintains a test-optional policy, with typically over half of applicants submitting their scores. On Tuesday, June 19, 2007, following a meeting of the Annapolis Group, which represents over 100 liberal arts colleges, Sarah Lawrence announced that it would join others who had previously signed the letter to college presidents asking them not to participate in the "reputation survey" section of the U.S. News & World Report survey (this section comprises 25% of the ranking). The 2018 annual ranking of U.S. News & World Report rates Sarah Lawrence tied for the 53rd best liberal arts college in the nation. In 2016, Forbes rated it 110th overall in its America's Top Colleges ranking, which includes 660 military academies, national universities, and liberal arts colleges. In 2016, Washington Monthly rankings—using criteria of social mobility, research, and service—ranked Sarah Lawrence 173rd in the liberal arts college category. In 2011, The Princeton Review ranked Sarah Lawrence first in its top ten list of colleges with the best class discussions. In 2012, The Princeton Review ranked Sarah Lawrence 1st in its top ten list of colleges with the best professors. In 2014, CampusGrotto.com ranked Sarah Lawrence as the most expensive college in the country with tuition, room & board, and other costs near $65,480 per year. Political activism has played a crucial role in forming the spirit of the Sarah Lawrence community since the early years of the College. As early as 1938, students were volunteering in working-class sections of Yonkers, New York to help bring equality and educational opportunities to poor and minority citizens, and the Sarah Lawrence College War Board, organized by students in the fall of 1942, sought to aid troops fighting in World War II. During a time when the College's enrollment consisted of only 293 students, 204 signed up as volunteers during the first week of the War Board. During the so-called McCarthy Years, a number of Sarah Lawrence's faculty members were accused by the American Legion of being sympathetic to the Communist Party, and were called before the Jenner Committee. Since that time, activism has played a central role in student life, with movements for civil rights and against the Vietnam War in the 1960s and for student and faculty diversity in the 1980s. Also in the 1960s, students established an Upward Bound program for students from lower-income and poverty areas to prepare for college. Theatre Outreach, the Child Development Institute, the Empowering Teachers Program, the Community Writers program, the Office of Community Partnership, and the Fulbright High School Writers Program are among the many programs founded since the 1970s to provide services to the larger community. In the late 1980s, students occupied Westlands, the main administrative building for the campus, in a sit-in for wider diversity. Students occupied Westlands again in 2016, in a sit-in supporting improved wages and safer working conditions for the college's recently unionized facilities workers. For many years, the College has been considered as being at the vanguard of the sexual rights movement and many progressive causes. The 42-acre (17 ha) Sarah Lawrence campus is atop a promontory above the banks of the Bronx River. Much of the campus was originally a part of the estate of the College's founder, William Van Duzer Lawrence, though the College has more than doubled its size since Lawrence bequeathed his estate to the College in 1926. The terrain is characterized by dramatic outcroppings of exposed bedrock shaded by large oak and elm trees. Many of the older buildings are in the Tudor Revival architecture style that was popular in the area during the early 20th century, and many of the College's newer buildings attempt an updated interpretation of the same style. The campus is divided into two distinctive sections, the "Old Campus" and the "New Campus": the first is roughly contained within the boundaries of the former Lawrence estate, and the area of the second was acquired sometime after the College's earliest years. The area outside the original Lawrence estate holds the College's newer facilities. Several stately, century-old, Tudor-style mansions will be found among these newer additions, including Andrews, Tweed, Lynd, Marshall Field, and Slonim House: each was once a private estate, purchased by the college during periods of growth and expansion. The more modest Tudor houses along Mead Way, which also had been private residences, now serve as dormitories for students at the College. "Slonim Woods" is a group of newer, townhouse-style dormitories, built on the grounds of Slonim House. The Campbell Sports Center was constructed in 1998 in response to an increased focus on physical fitness and sports. This facility includes an indoor pool, gymnasium, track, squash courts, and weight rooms. In 2004, the College completed construction of a modern visual arts facility, the Monika A. and Charles A. Heimbold Visual Arts Center, with sleek architecture and environmentally friendly aspects which earned the College national press attention. Just down the road is Hill House, a six-story apartment building purchased by the College in the late 1990s that now lodges students. Across the street from Hill House is the large Wrexham house, also in the Tudor style, which the College purchased from the government of Rwanda in 2004; this building, once home to the Rwandan consul, has been renovated and is used for various postgraduate programs. At the opposite end of the campus stands the Science and Mathematics Center, completed in 1994. Bates Center for Student Life is one of the original campus buildings. A huge facility designed in the English Tudor style that is common in the area, it has housed not just offices and classrooms, but everything from maids’ quarters to dining halls to laboratories and arts facilities. At one time, it was home to a miniature basketball court that is now a faculty dining room, though the lines of the court can still be seen on the floors. Over the years, programs in science, visual arts, and physical education have grown to the point that they have spilled over elsewhere on the campus, requiring three buildings of their own. Bates has always been home to the College's main dining facility and also houses the popular "Health Food Bar." The Esther Raushenbush Library, designed in 1974 by Walter, Burns, Toan & Lundein an architectural style meant to interpret in a more modern and sleek fashion the implied buttresses and strong features of its much older neighbor, Andrews House. The Raushenbush Library houses over 300,000 volumes. The Alice Stone Ilchman Science and Mathematics Center, completed in 1994, is situated on the far north end of the campus. It houses science laboratories in addition to classrooms and faculty offices. The building is named for former president Alice Stone Ilchman. The Marshall Field Music Building was originally created as part of William Lawrence's residential neighborhood, Lawrence Park West. Built in the Georgian Colonial style, it was situated on 3 acres (12,000 m2) of landscaped land when the college purchased it in 1960 to house the music department and to provide additional student housing. Prior to the purchase, President Harold Taylor played his clarinet in several of the rooms to test the acoustics. The Monica A. and Charles A. Heimbold Visual Arts Center is the newest building on campus. The building was designed by Polshek Partnership Architects. Completed in 2004, the building has garnered national press for its 'green' design. Relating to the college's stated goals, the building engages the landscape and existing campus circulation patterns, promotes student engagement through transparency, and takes a leadership role in sustainable design. The jury applauded its inventive use of materials; consistent development of the project in relation to the original concept; well-integrated plan/section; and exemplary use of building siting, solar orientation, daylighting, and locally quarried fieldstone to achieve LEED certification. The American Institute of Architects awarded a special 'Sustainable Architecture Honor Award' to the project as well as First Honor Awards at its 2005 “Celebration of Architecture”. The Campbell Sports Center - One of the newest buildings on campus, the Sports Center was completed in 1997 and houses a swimming pool, a rowing tank, a weight room and exercise center, an indoor running track, squash courts, a basketball court, classrooms, locker rooms, and administrative offices. The Charles DeCarlo Performing Arts Center, remodeled and greatly expanded in 1974, is a large facility on the western end of the South Lawn. Named for former College president Charles DeCarlo, the complex comprises the Bessie Schönberg Dance Theatre, the 200-seat Suzanne Werner Wright Theatre, the 400-seat Reisinger Auditorium, the 117-seat Cannon Workshop Theatre modeled after Shakespeare's Globe Theatre, and rehearsal spaces and work areas. The College bookstore is located in the PAC. The Ruth Leff Siegel Center, which is almost exclusively referred to as "The Pub," was originally constructed as a gardener's cottage on the Lawrence estate, then used as an infirmary and later as a faculty house. When the College began admitting male students in 1968, it became temporary housing for men. During the 1970s, the space was remodeled and christened “The Pub” for use as an informal dining hall and as a space for student activities. During the 1980s, it was renamed “Charlie’s Place,” honoring former President DeCarlo. In 1998, the entire structure was renovated, an addition was built by the architects Buttrick White & Burtis, and the new complex took on its current official name. Today, it houses primarily a café serving on-the-go food, as well as two TV lounges. 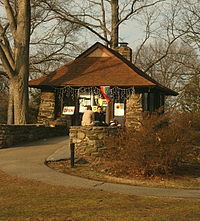 The Tea House, also known as the "Tea Haus," because its façade evokes German architectural motifs, was originally a gazebo built by the Lawrence family on a small rocky hill on the north lawn of their estate. After being saved by a student petition from a demolition that was called for by architect Philip Johnson in 1960, it was converted to an enclosed building with large windows and a fireplace that now houses a café selling a variety of teas and baked goods. While it is a fact that the building housed the office of history faculty member Charles Trinkaus from the 1950s through 1970, there seems to be no evidence to support the persistent campus rumor that the Tea House was once the office of long-time faculty member Joseph Campbell. Andrews Annex, built in the 1990s adjacent to Andrews House, houses a number of administrative offices. Lyles House is home to the College's Health Services Center. The President's House, built in 1921 and designed by architect Louis Bowman of McKim, Mead & White, is an example of 16th century Tudor-style architecture. Its living room features restored carved beams, representing the various trades, from a 16th-century Tudor mansion in England. Additionally, above the mantel a Christian creation story is told in intricate wood carving. Campus legend dictates that a secret panel exists in the living room leading to a wine cellar, which was built during Prohibition. The President's House has housed the College's presidents since 1954, when the first President's House, located north of campus, was demolished to make way for the Sprain Brook Parkway. Robinson House on Mead Way is home to the College's communications department. Until 1952, it housed "The Caf," a student coffee shop, on its main floor. Westlands is primarily an administrative building, but its top floor houses a number of student living spaces. Completed in 1917, it is the oldest building on campus and was home to Sarah Bates Lawrence and William Van Duzer Lawrence before being given to the College. Dynamically situated at the highest point of elevation on the campus, it is another example of English Tudor architecture by Bates & How. When completed the home was pictured on the front page of the New York Times. It has been the heart of the campus throughout the history of the College and, owing to its massive size, it now houses the president's offices, the Office of Admission, the Office of Financial Aid, the Office of the Registrar, the Office of International Programs, the Career Counseling Office, the offices of all of the College's deans, and a number of meeting spaces in addition to the top-floor dorms. The Wrexham Road Property, acquired by the College in 2004, is a large manor house that once belonged to the government of Rwanda and used as a home for its consul. The building currently houses various graduate-level programs. Andrews House, a former manor house purchased for $200,000 by the College in 1935 from Arthur Lawrence, a son of the College's founders, is known for its high ceilings, fireplaces, and its spiraling main staircase. The house is designed in the Germantown Colonial Style by architect Penrose Scott. The majority of the building houses students, but it is also the home of the College's Department of Operations and Facilities and to the offices of Writing faculty. Andrews Court refers to the twelve cottage-style buildings to the south of Andrews House. Built in 1974, the buildings have, on average, about eight units each in addition to full kitchens, living rooms, and bathrooms. Tweed, a former manor house, is home to a number of large dorm rooms in addition to a pair of classrooms. Curtis is home to a number of dorms, and is also part of the Early Childhood Education complex. Lynd House, another former mansion, is home to mostly living spaces. The building's adjacent carriage house has been converted into student housing. Hill House, bought by the College in the late 1990s, is a seven-story apartment building on the extreme southern end of the campus. At present, the majority of the apartments in the building are occupied by students, but a number of them remain in the possession of the original tenants who occupied them when the building was purchased by Sarah Lawrence. Most of the apartments are quite large and each has a full kitchen. Apartments on the upper floors with south-facing windows have, on clear days, a view of the Empire State Building. Kober is home to dorm rooms, but is also a part of the Early Childhood Education complex. It was donated to the College in 1951 by Otto Frohnknecht in memory of his daughter, Margaret Frohnknecht Kober, who graduated from Sarah Lawrence in 1935. There was once a bowling alley in its basement. Morrill is the former maid's quarters to the President's House, and now is home to faculty offices. Slonim House was formerly a manor house that is now occupied by dorms and by the College's Center for Continuing Education and Office of Graduate Studies. Slonim Woods is the group of 10 purpose-built living facilities constructed in 1977. They consist of eight single person dorm rooms arranged around a central communal living space. The "Old dorms" refer to four original purpose-built student housing structures to the immediate north of Westlands in what is frequently referred to as the "central campus". Dudley Lawrence, one of the sons of William and Sarah Lawrence, achieved the remarkable feat of constructing three of these buildings in one year (1926–1927). The halls were designed by William Augustus Bates, who repeated the Neo-Tudor style of Westlands through the use of stone and timber materials, and mansard roofs. The interiors are also in keeping with the English Tudor architectural style found on most of the older buildings in the area, with thick plaster walls, hardwood floors, and leaded windows (since replaced with more energy-efficient double-pane windows). MacCracken, built a few years later than the other three, is situated to the south of Dudley Lawrence. The original elegant living rooms that were found in each building, excepting MacCracken, are now used as classrooms. Dudley Lawrence, houses two classrooms in addition to living spaces. It is named for William Lawrence's son, who oversaw the construction of the Old Dorms. OSilas, originally named Gilbert for one of the College's original trustees, is the northernmost building of the four and is known for being quiet and populated with the College's more studious set. MacCracken, named for Vassar College president Henry Noble MacCracken, is a few years younger than its neighbors and has, at various times, housed the College library, the bookstore, and a number of other facilities in addition to living spaces. Although it still serves as a dormitory, it now also houses dance studios, meeting spaces, and administrative offices. Titsworth is an all-girls dorm and was also named for one of the College's founding trustees. It occupies the space between Gilbert and Dudley Lawrence and is also home to the Titsworth Lecture Hall. 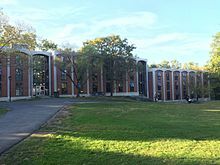 Designed by the renowned architect Philip Johnson in the sparse modernist style of the time, the "New Dorms" were completed in 1960. The architectural style of the buildings is meant to be a modernist reflection of the three older dorms (Gilbert, Titsworth, and Dudley Lawrence) that stand on the opposite side of the North Lawn. The three buildings that comprise the New Dorms are connected by two glass atria in which the buildings' primary stairwells are found. With the exception of the large apartments in Rothschild, these dorms typically house first-year students. Rothschild comprises apartment style, air-conditioned dorm spaces with kitchens, living rooms, and an elevator. The basement houses a number of small classrooms and studios in use predominantly by the theater department. Garrison is a traditional dormitory-style building with shared bathrooms. Taylor is nearly a replica in the design of its neighbor, Garrison. The first president was Marion Coats from 1924 to 1929. She was a friend of Vassar College President Henry MacCracken and of Sarah Lawrence founder William Van Duzer Lawrence. Coats had traditional views of women's role in society that were at odds with her progressive approach to women's education. Among the prominent current or recent faculty of the college are fine art photographer Joel Sternfeld, poet Suzanne Gardinier, novelist Melvin Jules Bukiet, novelist William Melvin Kelley, novelist Tao Lin, poet Marie Howe, film historians Gilberto Perez and Malcolm Turvey, puppet-theatre artist Dan Hurlin, dancer/choreographer Sara Rudner, Jewish historian Glenn Dynner, scholar of Buddhism T. Griffith Foulk, philosopher Michael Davis, and economist Franklin Delano Roosevelt, III. In 2005, current faculty member Eduardo Lago won the oldest literary prize in the Spanish-speaking world, the Premio Nadal. In 1934, Joseph Campbell was offered a position as a professor at Sarah Lawrence College which he held until his retirement in 1972. Perceptual psychologist Rudolf Arnheim was on the faculty at Sarah Lawrence College for 26 years, beginning in 1943. Author Grace Paley taught at Sarah Lawrence for many years. Novelist and folklorist Heinz Insu Fenkl taught at the college at the beginning of his career. Argentinian choreographer Anabella Lenzu, work in New York City, is an adjunct professor teaching modern, ballet, and dance history. Sarah Lawrence alums who have entered the entertainment industry include film directors J. J. Abrams and Brian De Palma and producer Laura Bickford, news personality Barbara Walters, and TV writer and author Noah Hawley. Notable actors include Jane Alexander, Sigourney Weaver, Larisa Oleynik, Cary Elwes, Sam Robards, Jordan Peele, Joanne Woodward, Téa Leoni, Golden Brooks, Eric Mabius, Melora Hardin, Andrew Lawton, Yancy Butler, Holly Robinson Peete, Robin Givens, Julianna Margulies, Lauren Holly, Max Bemis, Tovah Feldshuh, Kyra Sedgwick, Elisabeth Röhm, Guinevere Turner, Jill Clayburgh and Alice Pearce. Carrie Fisher attended Sarah Lawrence, but left prior to graduating to begin filming Star Wars. Musicians include Yoko Ono, JD Samson, Lesley Gore, Carly Simon, jazz singer Stacey Kent, and Ira Kaplan of Yo La Tengo. Win Butler of Arcade Fire attended Sarah Lawrence but left after his first year to move to Canada. Dylan Brody, a humorist, author, and playwright, studied theater at Sarah Lawrence. Peter Gould, writer and producer of Breaking Bad, attended Sarah Lawrence. Fine Arts — Alumni who are successful artists include Janine Antoni (sculptor and performance artist), Cady Noland (conceptual sculptor and installation artist), Judith Inglese (artist, ceramic muralist and children's book illustrator), Jedd Novatt (sculptor and painter), Alice Brock (artist and retired restaurateur, of "Alice's Restaurant" fame), and Yoko Ono (artist, performance artist and musician) who studied music. Dance — Alumni of the dance department at the College include MacArthur Genius Grant awardee Meredith Monk and choreographer John Jasperse. Alumni involved in politics include Amanda Burden, Director of City Planning for New York; Sharon Hom, Director of Human Rights in China; and two former members of the United States House of Representatives: Democrat and President Barack Obama's former Chief of Staff and Mayor of Chicago Rahm Emanuel; and former Republican Congresswoman Sue W. Kelly. Vera Wang, former Vogue editor and fashion designer, and Paul Johnson Calderon, television personality and fashion journalist, both attended Sarah Lawrence. Alice Walker, the author of The Color Purple, is an alumna. Ann Patchett, author of Bel Canto, is a graduate, as is Donna Raskin, book author and magazine writer; Constance Cappel, author; and Louise Glück, a poet and winner of the Pulitzer Prize. Alumna Nancy Huston is the author of numerous works and recipient of the Prix Femina in 2006 for the novel Lignes de faille (English translation: Fault Lines). Playwright and lyricist David Lindsay-Abaire won the 2007 Pulitzer Prize for Drama for his play Rabbit Hole. Sarah Lawrence College is the member of Skyline Conference of NCAA Division III. The College sponsors intercollegiate teams in crew (rowing), men's and women's cross country, equestrian, men's basketball, men's and women's tennis, men's and women's volleyball, men's and women's soccer, women's softball, and men's and women's swimming. In March 2011, the College announced that it would seek membership as a Division III member of the NCAA. The College will compete as a full member of Division III in the 2015-16 academic year after receiving a waiver to the required four-year 'provisional' period. In April 2013, Sarah Lawrence announced that it would join Skyline Conference beginning with the 2014-15 season. The college will quit the current Hudson Valley conference after the 2013-14 season. The Skyline Conference contains several schools including SUNY Purchase and Yeshiva University which has played against Sarah Lawrence regularly over the past few years. The College's official mascot is a Gryphon by the name of Godric. It was chosen in the 1990s to represent the College's athletic teams after a long period of fielding sports teams without one. Unofficially the student body had long adopted the large resident population of 'Black Squirrels' as a de facto mascot to the college. The position of silent mascot that the 'Black Squirrel' occupied was financially endorsed by the college itself with the production of various Black Squirrel merchandise (including Sarah Lawrence clothing branded with the Black Squirrel image) and plush toys. It is only recently (post-2003) that efforts on the behalf of the college to establish the Gryphon as the icon of Sarah Lawrence have begun to take root. ^ "U.S. and Canadian Institutions Listed by Fiscal Year (FY) 2018 Endowment Market Value and Change in Endowment Market Value from FY 2017 to FY 2018". National Association of College and University Business Officers and Commonfund Institute. 2018. ^ "Sarah Lawrence College At-a-Glance". Retrieved 2 March 2018. ^ Sarah Lawrence College At-a-Glance ("Sarah Lawrence College occupies 44 wooded acres in Yonkers, NY") Retrieved March 2, 2018. ^ The Village of Bronxville ("Although nearby Sarah Lawrence College, founded in 1926 by William Lawrence to honor his wife, has a Bronxville postal address, it is actually located in Yonkers.") Retrieved March 29, 2014. ^ "Sarah Lawrence College". Retrieved 7 December 2016. ^ "Sarah Lawrence College". www.usnews.com. 2017. Archived from the original on 2017-02-27. ^ Sarah Lawrence Ranks #1 for Best Classroom Experience: The Princeton Review Retrieved March 4, 2017. ^ "Best Colleges for Classroom Experience - The Princeton Review". www.princetonreview.com. ^ "Sarah Lawrence College". Forbes. Retrieved 2017-07-11. ^ a b Kaplan, Barbara (29 January 2014). Becoming Sarah Lawrence. Sarah Lawrence College. Archived from the original on 4 February 2014. ^ Lambert, Bruce. "Harold Taylor, Novel Educator And College President, Dies at 78". The New York Times. The New York Times. Retrieved 2018-03-13. ^ "Sarah Lawrence College". Times Higher Education (THE). Retrieved 2017-07-11. ^ "At a Glance: About SLC". Sarah Lawrence College. Retrieved 2014-01-29. ^ "Study Abroad in Havana, Cuba". Sarah Lawrence College. ^ "Sarah Lawrence Exchange with Eugene Lang". Retrieved 3 March 2018. ^ "Sarah Lawrence Study Abroad in Japan". Retrieved 3 March 2018. ^ "Study Abroad in Havana, Cuba". Retrieved 3 March 2018. ^ "Sarah Lawrence Graduate Programs". Retrieved 3 March 2018. ^ "Best Colleges 2019: National Liberal Arts Colleges Rankings". U.S. News & World Report. November 19, 2018. ^ "2018 Rankings - National Universities - Liberal Arts". Washington Monthly. Retrieved November 19, 2018. ^ Gross, Jane (13 November 2003). "Sarah Lawrence College Drops SAT Requirement, Saying a New Writing Test Misses the Point". The New York Times. Retrieved 23 May 2010. ^ a b Tolela Myers, Michele (11 March 2007). "The Cost of Bucking College Rankings". The Washington Post. ^ "U.S. News Statement on College Rankings". U.S. News and World Report. 12 March 2007. Archived from the original on 5 January 2013. ^ Jaschik, Scott (12 March 2007). "Would U.S. News Make Up Fake Data?". Inside Higher Ed. ^ "The 10 Colleges With The Best Class Discussions". 12 January 2012. Retrieved 7 December 2016. ^ "Professors Get High Marks". 12 July 2012. Retrieved 12 July 2012. ^ "Most Expensive Colleges and Universities". Retrieved 7 December 2016. ^ Horowitz, Helen Lefkowitz (1993). Alma Mater: Design and Experience in the Women's Colleges from Their Nineteenth-Century Beginnings to the 1930s. Amherst: University of Massachusetts Press. ^ Fried, Richard M. (1990). Nightmare in Red: The McCarthy Era in Perspective. Oxford: Oxford University Press. ^ United States. United States Congress. Joint Committee. A Directory of Urban Research Study Centers. Washington: United States Congress, 1977. ^ a b Frank Sanchis (1977). American Architecture - Westchester County, New York Colonial to Contemporary. North River Press. p. 426. ^ Frank Sanchis (1977). American Architecture - Westchester County, New York Colonial to Contemporary. North River Press. p. 358. ^ "Alice Pearce". Daytona Beach Morning Journal. Associated Press. March 4, 1966. Retrieved October 3, 2015. ^ "Yoko Ono - Biography, Albums, Streaming Links - AllMusic". Retrieved 7 December 2016. ^ "NCAA Approves Acceleration of SLC Membership". Retrieved 7 December 2016. ^ "Sarah Lawrence College Joins Skyline Conference". Retrieved 7 December 2016. Wikimedia Commons has media related to Sarah Lawrence College.